This classic 2BR cottage-On the Rocks- has been recently updated and offers a traditional American vacation. You will descend a set of wooded stairs to reach your rental, which sits on the rocky shoreline—so close you’ll hear the lapping of the waves from the deck. The shops, restaurants, and attractions of Boothbay Harbor are minutes away by car, as are historic Ocean Point Inn and the Ocean Point Preserve. The main living space features a casual coastal-inspired décor, hardwood floors, exposed beams, wood-paneled walls, and a wood-burning potbelly stove. Relax on the sofa (also a sleeper sofa) and watch a movie on the 32” Smart HD TV with Blu-Ray DVD player and Netflix. Play board games, sit with a book, or gaze out the bank of windows at the stunning ocean view. The open kitchen has efficiency-size appliances (no dishwasher) and all the utensils you’ll need to whip up tasty meals. Gather at the dining table with seating for six, or eat out on the deck with an unparalleled ocean view. There you’ll find a table with seating for four and two lounge chairs. Sleep soundly in the master bedroom on a comfortable queen-size bed. The guest bedroom is furnished with a plush full-size bed. Both rooms share the full bath with shower. Parking for three cars is provided. Please note that pathway and stairs down to cottage are uneven and not suitable for those with mobility issues. 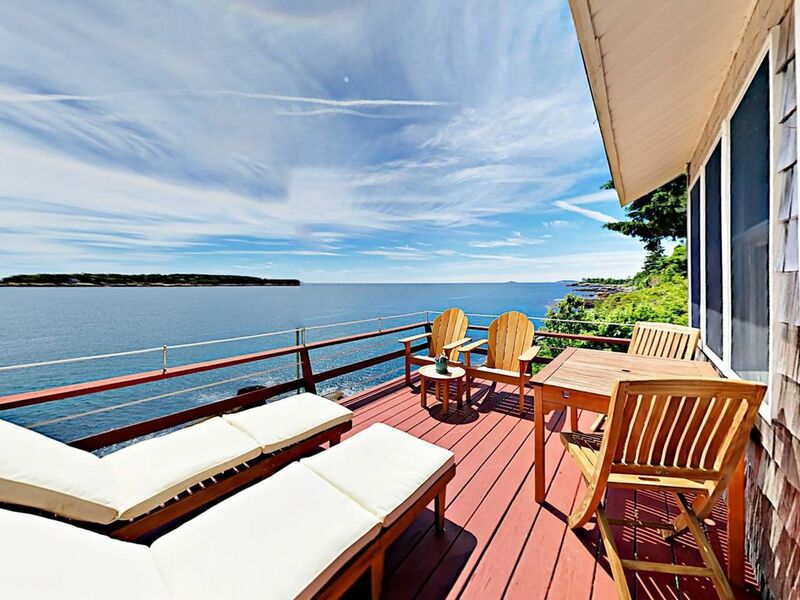 Locally known as having the best view on the Boothbay Peninsula, this cottage looks out on Christmas Cove, both Inner and Outer Heron Islands and the Atlantic Ocean beyond. Watch local lobsterman check their traps just yards off the deck. Drive just 5 minutes to the East Boothbay General Store for a morning latte, breakfast and lunch sandwiches, homemade pizza and cookies. Two popular East Boothbay restaurants, The Carriage House and Lobsterman’s Wharf are just 5 minutes from the cabin. For the nature lovers in your group, the walking trails at the Linekin Preserve are less than 3 minutes away. Enjoy the shopping, dining, and entertainment of Boothbay Harbor, just a 10-minute drive from the cottage. Visit the Coastal Maine Botanical Gardens, Boothbay Harbor Country Club and Maine State Aquarium, all less than 15 minutes away. In the mood to get out on the open water? Head to Balmy Day Cruises for a day trip to Monhegan Island or Cap’n Fish’s for daily whale watching tours. This is our second time staying in this beautiful cottage. Upon arrival this time we found a broken refrigerator which was replaced with a college dorm refrigerator. Understanding that things happen, our complaint is we were not notified so that we could come prepared with our cooler. Also, when we were asked to text with any concerns, we expressed how disappointed we were about the lack of refrigeration for a weeks stay and TurnKey NEVER responded. That was very unprofessional and disrespectful. The inconvenience of grocery shopping daily was not our plans for a vacation. The last day, we were asked if we had any concerns. I mentioned our dissatisfaction again , and of course the apologies came then. Loved the house and location. Was NOT satisfied with the property management. We&#x2019;ve rented a lot through VRBO. would definitely rethink if TurnKey is managing it. In an effort to be brief, awesome would describe the following: everything about the place...especially the deck. To the owners in Austin, should you decide to sell, I would like the right of first refusal! The location and the view of this cottage were amazing,you are on the water,if you leave the windows open at night you can ear the waves.Really clean and comfortable. Boothbay is really close and there are few good restaurants and a beautiful Botanical husband and I will come back. My family of four enjoyed a wonderful stay at the East Boothbay cottage! The kitchen was well equipped and everything we needed in the cottage was provided. What made it a step above the rest was the incredible deck overlooking the water! We enjoyed sitting on the comfortable Adirondack chairs at sunrise, during the day watching the boats and stargazing at night. Highly recommend this for a rustic but comfortable get away in beautiful mid-coast area of Maine!